I'm fairly familiar with the architecture of distributed applications and the concept of a service bus, though I don't have any first hand experience with NServiceBus. 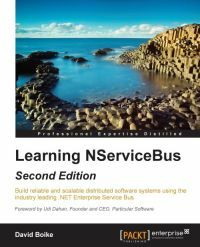 When I got the offer to review Learning NServiceBus - Second Edition, written by David Boike and recently published by Packt Publishing, I gladly accepted the opportunity to learn more about this premium service bus implementation for .NET framework. The book starts out with a short step-by-step tutorial for creating a simple distributed application using NServiceBus, but it quickly moves on to a more advanced overview of the platform as a whole and the principles it builds on. Although most of the book revolves around development, it doesn't constrain itself to it. Towards the end, operational topics are covered as well: application configuration, administration, monitoring, scaling; showing the scope of the platform, being much more than just a development framework. The author doesn't focus on NServiceBus alone; instead he gives quite a lot of attention to the basics of messaging and service buses, doing his best to provide incentives for a distributed application design. No matter the previous experience, by the end of the book the reader should be acquainted enough with NServiceBus, to recognize a project requiring it. When that happens, this introductory book won't be enough to get the job done. Still, once you've read it, it will be much easier to depend on other (mostly online) resources, listed in the book. I also like, how the author pointed out the most important changes in the latest version of NServiceBus, which will prove more than useful when reading older blog posts about it. Whether you're starting to learn about NServiceBus, considering the adoption of distributed architecture in a .NET framework based project, or just want to know what NServiceBus is about, you should read this book. You never know when this knowledge might give you a different perspective on the challenges in your daily work.